On my worst days, emotionally—you know, when my sense of purpose vanishes and not existing feels like the preferable option moving forward—I have a tendency to seek out movies or music that reflect how crappy I'm feeling. Escapism is great and all, but it doesn't quite cut it when I'm sitting on the bathroom floor crying my eyes out and thinking about how great it would be to dive off a tall building. We get lots of movies and music and books that hit that "real talk," but games that can get into my head in those dark moments are rarer. Here are just a few of them, each representing a facet of my own personal struggles when I'm at my lowest. Like many other severely depressed people, I've been known to find both solace and my own demise at the bottom of a fifth of whiskey. Bulletstorm is basically a shooter about that experience. The protagonist of this story—haunted by the assassinations of innocent civilians he had unwittingly carried out on the order of the game's villain, General Serrano—has developed an affinity for drink. He and his crew go rogue, becoming space pirates, but they bring their newfound habit with them. When our "hero", Grayson, sees a chance at revenge, he sends his ship and crew, through the foggy haze of their latest binge, into a suicidal attack on Serrano's much larger star cruiser. It doesn't go well, and all but one of his friends end up quite dead when their ship crashes on a nearby planet. It's a familiar situation, going from sad drunk to aggressive, angry drunk to "shoddy makeshift noose around your neck" drunk — sometimes figuratively, as is the case here, and sometimes literally, which has been more my style since I don't have a spaceship. It's that part where you wake up sober and fear—or believe, or even realize—that what you dished out in that haze did real damage to your life. And what follows after the crash is just as familiar: a surreal fever dream of extremely profane manic aggression borne from an attempt to compensate for mistakes made during an episode of depression. It's that part where you wake up sober and fear—or believe, or even realize—that what you dished out in that haze did real damage to your life. I ruin friendships, Grayson gets friends killed. And to think this is supposed to be a comedy game. Don't Starve is, it turns out, the gamification of the mindset of a suicidal person. You're simply dumped in a strange place all by yourself and instructed to not die, and not dying involves a lot of wandering aimlessly and gathering supplies and constructing tools and so forth. It's a grind, and it's busywork, and for what? To continue existing? What a paltry goal. 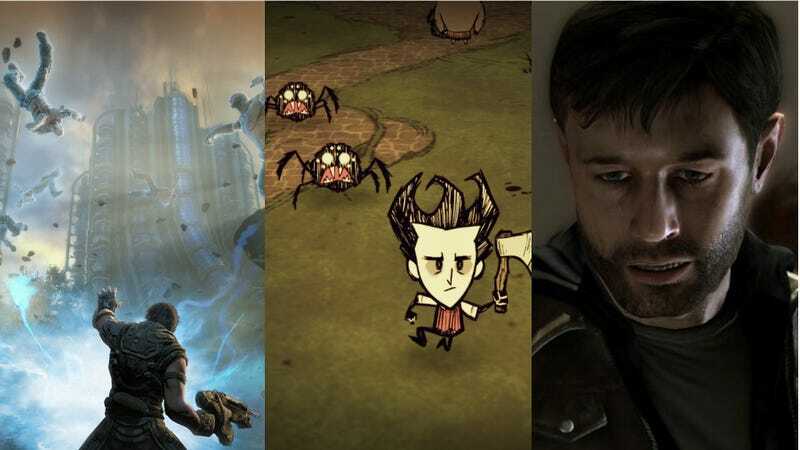 The hook for Don't Starve, just as for life itself, is to see what happens if you keep exploring the world and carrying out the mundane tasks that make it possible to do so. Committing suicide is to decide that reward won't or can't be good enough to warrant that struggle—at least that's always been my view when I've considered going there. Committing suicide is to decide that reward won't or can't be good enough to warrant that struggle. But a strange thing happened when I revisited Don't Starve in preparation for writing this: I played one game for a few hours, and then let myself die by provoking some frogs and letting them kill me instead of running away. And that made me sad because death is permanent and everything I'd worked for was lost forever. When I'm suicidal in real life, though, I don't normally think about how much work it took to get to that moment; I just think about how the future is hopeless, assuming my investments in my own existence have been rendered moot. That contrast is something to ponder when you're down in the dumpiest of dumps. "Look at what will be lost when you kill yourself." FTL: Faster Than Light And Why Do We Even Keep Trying? FTL, another perma-death roguelike like Don't Starve, has you command a starship with a small crew as you're chased across the galaxy by some bad guys. Along the way you'll face other bad guys and have to make some choices and probably die before you reach your destination. The whole game is randomly generated, so you never know exactly what's going to happen, but you might, for example, have to decide whether to fight a slaver ship that clearly outclasses you or hand over one of your crew members. You may have to choose between helping out somebody being chased by pirates or letting them be murdered, enslaved or brutalized in some other terrible way. Things can go wrong in a hurry, and the experience is not predictable. Suicide is often about judging that the chances of getting out of a specific predicament are too low to warrant the pain that continuing to try will likely cause. But the recurring theme is that you're probably going to lose, but you try anyway. Suicide is often about judging that the chances of getting out of a specific predicament are too low to warrant the pain that continuing to try will likely cause. A game of FTL is usually pretty short, and we keep fighting and starting over even though it's probably futile because it's so thrilling and maybe, just maybe, the next try will be the breakthrough. It's been a little over two years since my suicide attempt in the real world, and I can look back on that time from this lofty perch of today and see that continuing to struggle through life has been pretty fun even with all my angst. As with FTL, even if in life I never get where I want to be, my attempts haven't stopped being entertaining yet. The Darkness is just about the most emotionally dour gaming experience I've ever played. Mob hitman Jackie Escatado turns 21 and learns he's inherited an entity called The Darkness — it's awakened and given him some pretty disturbing demon powers. But that's not why this game so effectively resonates with the suicidal me. The Darkness is bleak and moody from the start, but a particularly touching moment occurs early on when Jackie and his girlfriend Jenny sit on the couch together and watch To Kill a Mockingbird. Jenny falls asleep with her head on his shoulder, and you can actually watch the whole movie like this in this scene. It's a true, human moment that carries so much weight. It's an emotional oasis of a moment. But then Jenny is kidnapped by the bad guys and executed right in front of Jackie. He does not respond to this trauma the normal video game way—namely, by swearing revenge and starting off on an angsty quest. No, he takes the gun that killed his girl and sticks it in his own mouth. Catharsis explodes out of the screen. "There are fates worse than death" is a pretty good cliche, and when my brain leans toward suicide it's because I'm expecting my own fate is going to be one of them. "There are fates worse than death" is a pretty good cliche, and when my brain leans toward suicide it's because I'm expecting my own fate is going to be one of them. Jackie had the same breakthrough, and he/we took action. He doesn't just cry while clutching the pistol nor does anyone talk him down. He just does it. And it feels good to me. This game has a lot wrong with it, but what it got so right was in letting you fail but forcing you to live with the consequences. Heavy Rain is a Seven-esque serial killer story about a person who kidnaps kids and makes their fathers pass a series of grueling and painful tests in order to get them back. You can fail these or even opt out when you're playing as Ethan, one of the dads. But that may not work out so well for him or those he cares about. There are three other playable characters, and making mistakes while playing as one of them can have consequences for the rest, too. This game has a lot wrong with it, but what it got so right was in letting you fail but forcing you to live with the consequences. Being a legit noir, Heavy Rain is extremely atmospheric and oppressive and makes you feel like garbage as you play, but if you, as I did on my first playthrough, get to the end and see two of your characters take dirt naps while the killer gets away because of your mistakes, well, that certainly doesn't improve the mood any. Heavy Rain is right there in the gutter with a solidly depressed person, but where it really resonates with somebody who just wants to die is in the way you can screw up so hard that people you care about may hate you and lives are ruined or ended. When I'm feeling ready to check out, it's usually because: I think I've goofed up my own life beyond repair; I think I've goofed something up for someone else/been enough of a jerk to someone I care about that they hate me; or I think I've goofed up bad enough that I've irreparably disappointed someone who matters. Heavy Rain lets you live through all those scenarios. And then die. It may not improve your mood but, thematically, it just feels right. Another PS3 exclusive game, but which is nothing at all like Heavy Rain, Sony Japan Studio's Rain is actually totally uplifting. It is, to my mind, about depression as represented by hulking monsters in a dark, rainy, empty city that exists only in our heads. Suicidal urges as an abstract idea are more complicated to combat than a large beast that is trying to eat you, no? But in Rain I see those things as one and the same. You aren't alone, and let's fight this together because we can't do it without each other. And further into the game you meet someone in the same boat you're in who you can help and who helps you, another on-point metaphor. You aren't alone, and let's fight this together because we can't do it without each other. Rain eventually stands as a story about beating back the tides of darkness and coming back into the light, and at only a couple hours long and with a relatively low difficulty it can be played in a single sitting pretty easily. So it's just about perfect for those particularly hectic dark spells, if you're looking for a way up. A note about all this: while watching movies and playing games works for me sometimes, and probably works for others as well, we all handle depression and thoughts of suicide in our own ways and treatments that work on you may not work on me or vice versa. But there are some resources that are available to all should you find yourself on the edge of suicide and unable to pull yourself back, such as suicide.org which contains lots of reading material and suicide hotline numbers all over the world. In the US, the National Suicide Prevention Line is 1-800-273-8255. Phil Owen is a freelance games critic and journalist. Follow him on Twitter at @philrowen, and send hate mail to phil.r.owen@gmail.com.